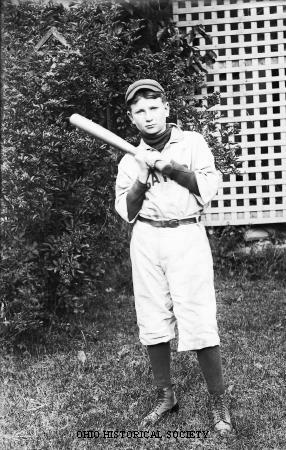 Photograph of a young boy in a baseball uniform holding a baseball bat, possibly in Cairo, West Virginia. This photograph was taken by traveling photographer Albert J. Ewing, ca. 1896-1912. Like most of Ewing's work, it was likely taken in southeastern Ohio or central West Virginia. Born in 1870 in Washington County, Ohio, near Marietta, Ewing most likely began his photography career in the 1890s. The 1910 US Census and a 1912-1913 directory list him as a photographer. A negative signed "Ewing Brothers" and a picture with his younger brother, Frank, indicate that Frank may have joined the business. After 1916, directories list Albert as a salesman. He died in 1934. The Ewing Collection consists of 5,055 glass plate negatives, each individually housed and numbered. Additionally, the collection includes approximately 450 modern contact prints made from the glass plate negatives. Subjects include infants and young children, elderly people, families, school and religious groups, animals and rural scenes. In 1982, the Ohio History Connection received the collection, still housed in the original dry plate negative boxes purchased by Albert J. Ewing. A selection of the original glass plate negatives were exhibited for the first time in 2013 at the Ohio Historical Center. The Ohio History Connection AV 71, AL04620 from the Albert J. Ewing Collection Collection.